A diesel sheen atop the water in a drainage canal in Carrollton led to the discovery Tuesday night of a leak from an underground tank at the Sewerage & Water Board plant, New Orleans city officials said Wednesday afternoon. Jefferson Parish fire officials received the first reports of an odor coming from the Leonidas canal near Metairie Road around 10 p.m. Tuesday, said New Orleans Fire Department superintendent Tim McConnell in a news conference Wednesday. The city’s hazardous-materials team was called in about an hour later about reports of a sheen on the water nearby, McConnell said, but it was too dark to determine the source then. Sewerage & Water Board officials began the work of cleaning up the diesel, and the investigation into its source continued at daybreak, McConnell said. From there, they traced it through the underground canals on South Claiborne Avenue back to the Sewerage & Water Board plant, where diesel is stored in a massive underground tank as a source of backup power. The diesel in the tank is supposed to be protected from leaks by a containment area, so officials have not yet determined how it escaped, McConnell said. Public safety is not threatened by the leak, McConnell said, and drinking water is not affected. Suction trucks are now collecting the fuel from the containment area, McConnell said, but officials do not yet know how much diesel has leaked out. 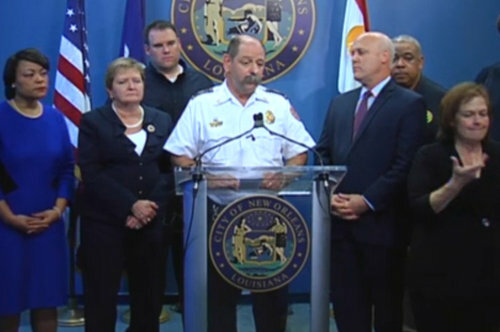 McConnell’s report came during a news conference Wednesday afternoon providing updates on the widespread issues with the city’s flood-protection system exposed by the rain that flooded Mid-City and other parts of the city Aug. 5. The system essentially remains at the same level it was prior to Aug. 5, with some small improvements, Landrieu said. The city has acquired 26 generators for additional backup power and most are in place, and one of the 17 broken pumps was repaired yesterday, bringing the number of operational pumps to 104. The city is conducting a review of all the pumps to ensure they are as reliable as they are believed to be, Landrieu said. “In addition to what we know is broken, there are likely other issues with the pumps that are currently believed to be operational,” Landrieu said. All of the work is being paid for by the Sewerage & Water Board’s rainy day fund, which has $85 million in it, Landrieu said. One significant expense will be a $22 million effort to clean out 15,000 catch basins that have been reported as clogged — a quarter of the catch basins in the city, Landrieu said. Landrieu reiterated that he is bringing in an emergency management team that will serve as a “bridge” to a new structure for the Sewerage & Water Board or a new director for it. He said he does not intend to sign any contracts that dramatically outlast his administration, and will leave any long-term decision to the next mayor and City Council. “We are not privatizing the Sewerage & Water Board,” Landrieu said.